CABINET OF CURIOSITIES: On The Trail Of The Minnesota Iceman! If you are a regular follower of the Daves then you know that we have a variety of interests with one thing in common, they borderline on the weird. Some of the things that make us happy in life are horror and science fiction movies, horror hosts, UFO’s, keeping tarantulas as pets and cryptozoology. 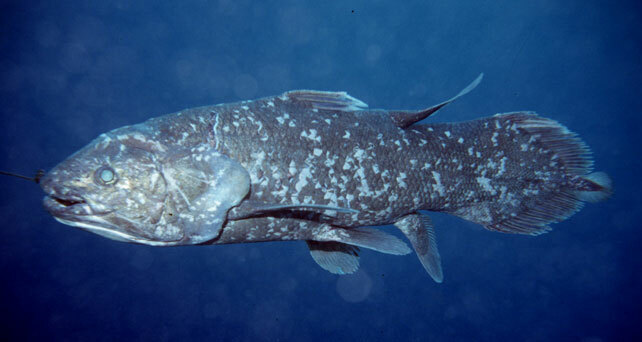 The coelacanth, a prehistoric fish thought to be extinct for millions of years rediscovered in 1938! 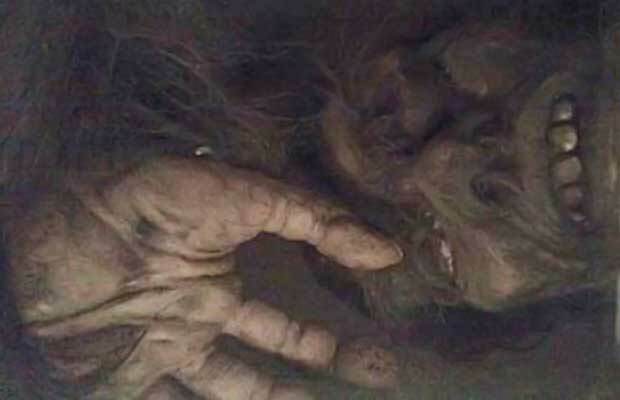 The story of the Minnesota Iceman has intrigued me for years because it actually seemed to be proof that there may be something to the bigfoot legend. 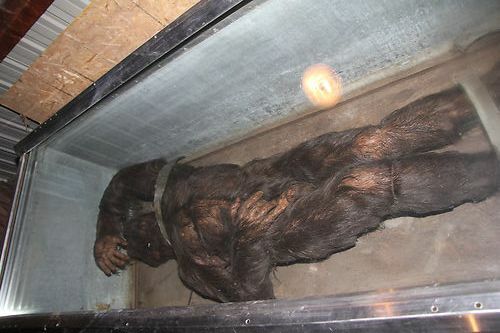 In the late 60’s zoology major Terry Cullen came across a travelling exhibit in Milwaukee displaying what appeared to be a dead bigfoot carcass frozen in a block of ice. 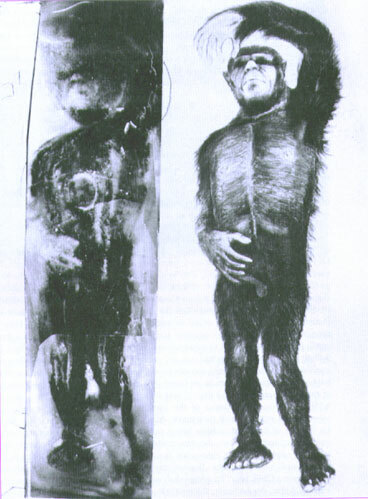 Because of the appearance of the specimen, he contacted Ivan T. Sanderson, a zoologist known for his nature writing and interest in cryptozoology. The owner of the exhibit was a man named Frank Hansen, who gave permission to Sanderson, as well as a man named Bernard Heuvelmans, to study the Iceman closer. What this meant was that they could observe it through the ice for as long as they wanted but were not allowed to touch the body in any way. Through the ice the specimen was very convincing and the body featured a fracture to the left arm as well as a dangling right eyeball, where this creature had supposedly been shot. The smell of rotting flesh emanated from the frozen coffin that housed the Iceman, proof to these gentlemen that they were viewing an actual dead body. If this was a fake, why would the creator go to the length of adding such details as a fracture and dangling eyeball? The long dark hair could also clearly be seen coming out of the skin, as opposed to glued on like many special effects artists do. 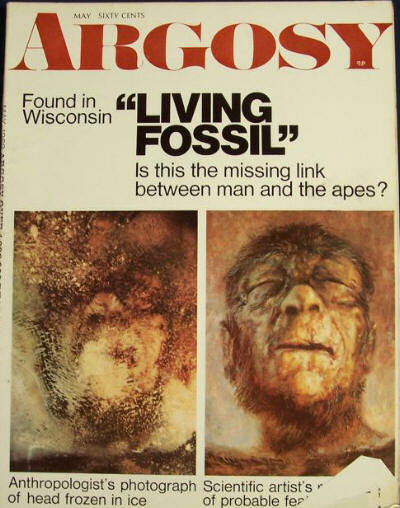 Their findings were published in Argosy Magazine and the idea of someone like Hansen traveling from town to town with a possible human corpse alerted local police and the FBI. When they came to investigate the body it had mysteriously disappeared. Hansen later went on tour again with the Iceman, but this time with a different body and one that could be shown as a fake if police or the FBI showed up. So, was the original body real later to be replaced with a fake? If so, what happened to the real body? If the “real” body was also fake, who was the artist that created such a realistic prop? Why has no one come forward to take credit? In 2013 the Minnesota Iceman went for sale on eBay, claiming to be the original prop used by Hansen in the late 60’s and early 70’s. It sold to a man named Steve Busti, owner of the Museum of the Weird in Austin, Texas. 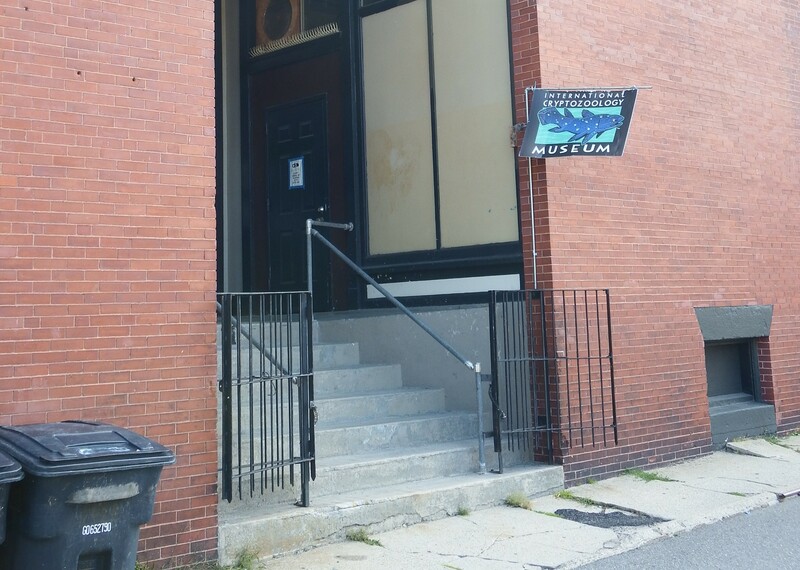 I was thrilled to learn that the Iceman was going to be on loan to the International Cryptozoology Museum in Portland, Maine. Both Daves visited this amazing place in the fall of 2014 (see HERE) and this was as good an excuse as any to go back! My nephew and I decided to take the 3 hour drive (4-1/2 hours after hitting Boston traffic and torrential rain storms) on August 21, 2015. I had no idea what to expect. I knew it was the “fake” Iceman but didn’t know how it would be displayed. On the one hand it would be cool if it was in ice but on the other hand, I really wanted to be able to see it clearly to appreciate the time and effort that went into making it. There was only one rule: no photography! I understood why as owner Loren Coleman wants as many people as possible to come and see the Iceman in person during its limited run from August, 2015 until February, 2016. If people post pictures all over the internet, why visit? In fact all pictures of the Iceman used in this blog are from Google. As soon as you enter, the display case is in the first room, right near the admissions’ desk. The wooden case is glass-topped with a large piece of cloth covering what is inside. You have to move the cloth to see the body. Let me say that I am very impressed with this creation! It is very well made and if this is the actual one used in the early 70’s, then the creator should be commended. The detail is beautiful and even not enshrouded in ice is very realistic. For me, the 4-1/2 hour trip was worth it just to see this piece of history and the International Cryptozoology Museum should be commended for obtaining it for this limited run. While there the place was very crowded which was a good sign as when Dave and I went originally, it was very slow. Places like this are important not only for their entertainment value but for the history they present. 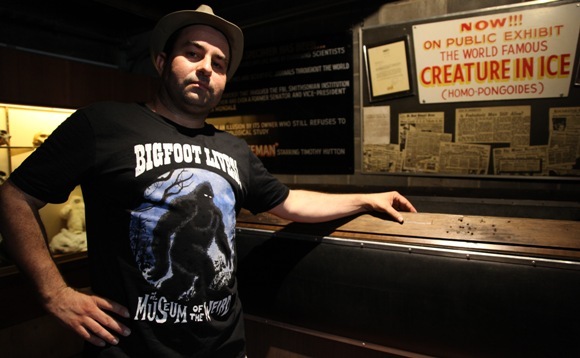 Even if you are not interested in cryptozoology, you are guaranteed to have a great time here and who knows, it may open your eyes to how weird, in a good way, the world truly is! This entry was posted in Cabinet of Curiosities (??? 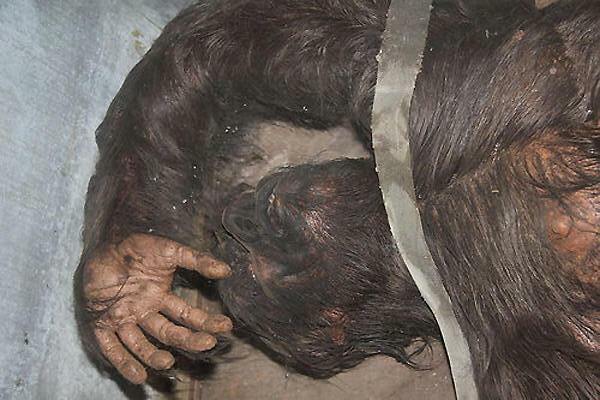 ), Cryptozoology and tagged Argosy, Bernard Heuvelmans, Bigfoot, Cryptozoology, Frank Hansen, International Cryptozoology Museum, Ivan T. Sanderson, Loren Coleman, Minnesota Iceman, Museum of the Weird, Steve Busti, Terry Cullen. Bookmark the permalink. ← Anime’ Midwest 2015 was an Anime-zing Experience!